Cut at 45 RPM for the first time ever! From the original 1964 Chess analog masters! Pressed at Quality Record Pressings! New gatefold jacket, with extra photos! Follow along as writer/professor Wayne Goins explores the creation of Folk Singer, and leads a visual tour of the former Chess Records studios, here. "The Quality Record Pressing is drop-dead quiet-as silent as the best Japanese pressings from the late 1970s-and the amount of inner detail released is simply astonishing...the sound is sweet, liquid and free of harshness and edge. The dynamics are mind-boggling. When Muddy takes it up ten notches to emphasize a point it's positively explosive in a way the 33 1/3 version only suggests." Music = 9/10, Sound = 10/10! — Michael Fremer, musicangle.com. Folk Singer has been an audiophile staple for years. It always gets a bunch of play at hi-fi shows. It's a no-doubter demonstration disc. But never before has it sounded like this! Never has it been cut at 45 RPM! There are a handful of landmark albums in any genre. In the blues, one of them is Muddy Waters' Folk Singer. Originally released in 1964, Folk Singer was the only acoustic album Waters ever recorded, thus becoming the first and perhaps best blues concept album ever. Muddy of course started out playing acoustic blues in the Delta, and he's clearly very comfortable in this return to his roots, which was designed to appeal to the mid-1960s surge of interest in folk music. Muddy's supporting cast includes a very young Buddy Guy on guitar, Willie Dixon at the upright bass and Clifton James on drums. This recording has enormous presence with ample room for Muddy's booming voice to resonate. Customer Reviews (4.96 Stars) 23 person(s) rated this product. I thought I had it dialed in. “Best under $3000 speakers” that I paid $1200 for, so $1200 LR loudspeakers), $2000 integrated amp, $350 restored/upgraded Cardas cable Dual vintage turntable with $100 Japanese stylus, fed into a $300 “monster killer”phono stage. Turned up to 81 dB on a Fri night. Muddy Waters Qrp 45rpm pressing. F-ing MAGIC. Have never heard the nuances, musicality, and passion that exude from these remasters until tonight. And if I can tell a difference between DSD and these 45RPM Remasters, you can, too. Unreal quality difference, no matter your previous reference. Buy now! Seriously, that much difference! I'm not sure I have words to express how good this album sounds. Don't hesitate, buy it immediately! Show off your HIFI with this one!! The hair of my arm stood up straight! This is crazy good..... Thanks AP!! I really couldn't imagine getting a better sounding recording of this session. Not to be too overly dramatic, but I actually got goosebumps listening to this...I really felt like they were all in the room with me. Recommended. It doesn't get any better. Not "much".,,,,"any." This is a perfect cut of a timeless piece. Incredible, what AP has done here. Buy it without hesitation, and invite Muddy into your listening room. This is a must own pressing of this classic album for any blues fan. Actually, you just need to be a music lover to enjoy this album. I own the Classic Records 200g release and it can't hold a candle to this pressing. If you're going to spend fifty bucks on only one album then this would be a great choice. It sounds as if Muddy Waters were sitting there at your side. The dynamics are astounding. One of my sonically most impressive records. Another great album for you. I loved the small room sound of this album and the old time stereo separation they achieved on this recording. An added plus is the great work of Buddy Guy and his guitar. But, as always Muddy steals the show on this recording. I highly recommend this wonderful bit of blues history, even if they choose the title 'folk singer,' don't kid yourself - this is back room blues of the first order. a lot of quite passages. u better keep it clean. I didn't know it was possible for vinyl to sound this good. Easily the best sounding pressing I own. Make sure you have your system at it's best. This pressing is so perfect it will expose all your system weaknesses. Your vibration and turntable isolation need to be in check. This pressing is dead, DEAD quiet vinyl. No surface noise at all. If your not a blues fan or a fan of muddy, This pressing will make you one.The packaging, mastering and pressing can't get any better. A real treasure. Well worth the price. I am really pleased with this purchase. Buy it, you won't regret it. Unbelievable sound for a true masterpiece! This is, in my opinion, a true American piece of art, the music art that we in Europe can only dream and wonder. And what about the sound quality? Impeccable, full of dynamics and emotion, one the best audiophile, if not the best, record I ever heard. Meraviglioso! Wonderful! This album is, without a doubt, the best sounding recording in my collection. The clarity, dynamics, presence and just plain realism all shine. Folks spend large sums of money to get the, "you are there" feeling when they close their eyes and listen. This album delivers that feeling! Put it on your deck, sit back, close your eyes and Muddy Waters is playing some amazing music just a few meters away. It is an experience that is easily worth the price of admission. The packaging is also first rate. Well done gatefold, high quality printing, etc. If you like Muddy Waters, or the Delta Blues, you will like this recording. PS. I just heard the Cat Stevens, Tea for the Tillerman pressing last night. Folk Singer is not a fluke. QRP knows how to press a record. I will be exploring their catalog for more gems! This recording is spare, quiet, minimalist as blues should be. The music is simple in that the artist(s) has/have plenty of room to either shine or fade. This is, of course, an example of the artists performing magnificently. The record is quiet -- any flaw in your system (any dirt on the record surface, harmonic tubes, ect...) will be exposed. In a way, this record is unforgiving in it's perfection. When non-vinyl listeners first encounter it, the universal expression is : "that's a RECORD?" It is sooo clean. The performance by the artists will have you leaning foreward in your seat as if the get closer...as if they are in the room with you. The urgency is palpable. The guitar strings vibrate with air, you can easily hear the degradation of the sound from the instruments, the vocals are present...still, it is quite smooth overall with intact soundstage. A lot of money, but this is significant musical history of the highest quality. This is a Great Edition. plenty of detail. I was told about this company and Chad by Russell Coco, and he knows and understands good sound quality! This is my first purchase but certainly not my last! I was floored at the quality in the shipping and of course the sound quality. At times I had to look around to see if Muddy's ghost was in the room playing and singing. I dont know all the "correct" things to say about the sound but, I can say this: THIS PRESSING BLOWS AWAY ALL OTHERS I OWN. Clean backgrounds and just fantasic dynamics. This is a fantastic recording that is extremely dynamic. I own the Classic records DAD of this as well. This 45 is a high quality pressing with a quiet background. You only hear the self noise of the period recording mics/amps...and the actual room that Muddy wWaters is sitting in. Every Mastering engineer has his/her own sonic signature....and this is no exception. Absolutely supurb! Silky black background--smoothest vinyl I've ever not heard. Trumps the Classic Records pressing which I have as well. The separation of instruments and voice within the soundstage both width and depth is astounding--could swear the musicians were right here in my listening room. I simply can't wait for more from Quality Vinyl. Thank you Chad, for your vision and perseverance in bringing the world the best vinyl ever produced! Wow is the word ! I have listened to this lp on the mfsl and classic 33rpm dozens of times thinking how great it sounded, untill now that is. This pressings blows away the mfsl and classic 33. Got this from Chad's (Acoustic Sound) personal recommendation at T.H.E. show ,Newport Beach, California. 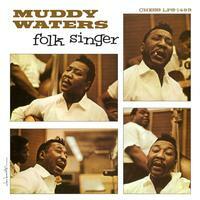 When he said "you'll be blown away" by this 45 rpm Album " Muddy Waters, Folk Singer"....he was dead on... I'm just speechless and very much glued to my sit listening to this album at home..Wish it had more tracks....recording engineering is just A++++. Highly recommended! Thank you Chad & Chad Stelly..hope to see more of Acoustic Sound booth/room in the coming Hi-end audio shows in California. I never owned the original so an't compare. But have heard nearly all the tunes over the years. This is the way blues was meant to be heard. Turn the lights down, grab a beer and enjoy.